I read two articles in the June 25, 2015 edition of The New York Times. One article, about the trial of the Boston Marathon bomber, appeared on the front page, and was headlined this way in the paper's print edition: "An Apology in Boston, and a Death Sentence." 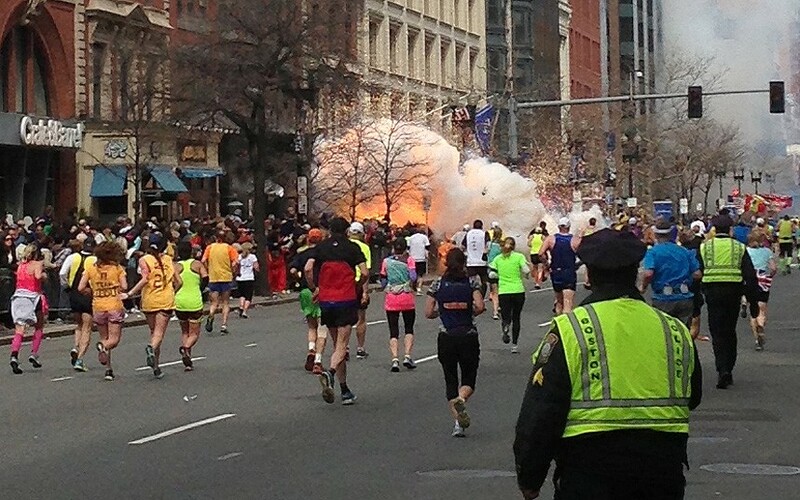 The second picture posted above shows the actual bombing in Boston. The other article I read, appearing on page 9 in the version of the paper that got dropped on my front walkway, was titled, "Documents Detail Workings Behind Drone Strikes." The picture at the top of this blog posting shows the results of a U.S. drone strike in Pakistan. These articles appear, at first glance, to be unrelated. But maybe not! In the article that reported on the sentencing hearing for Dzhokhar Tsarnaev, who was found guilty of carrying out the bombings at the Boston Marathon in 2013, the reporter told readers that Tsarnaev had apologized, and that Tsarnaev had explained that "the bombings were revenge for all the innocent Muslims killed in American-led wars." Neither the apology nor the explanation moved the judge or those victims who came to the sentencing hearing. One victim, speaking of a friend who was killed, said that "she was not the enemy ... They didn't even know her." The article on U.S. drone strikes began with the revelation that the United States had deployed a drone to kill a doctor in Yemen. The doctor was killed because the U.S. government believed that he might, in the future, try to implant a bomb, surgically, into a suicide bomber, as a way to avoid airport security procedures. The article differentiated Britain's official policies on drone use from those policies that guide the drone killings carried out by the U.S. government. According to the article, "Britain has carried out drone strikes only in war zones in Afghanistan, Iraq and Libya." Yemen is not a "war zone." Neither is Pakistan. Nonetheless, the official U.S. government policy is that the President has the right to kill people in those countries if he decides that they are a terrorist threat. In the case of the doctor, mere suspicion that the doctor "might" do something in the future was enough to sentence him to death (and to expose to possible death and injury any persons who might be in his immediate vicinity when the drone killed him). In Pakistan, U.S. drone strikes have killed more than 3,213 people. Only 2% of these were actually terrorist targets. That means that 3,149 of those killed were (likely) "innocent Muslims." Those deaths are what motivated the Boston Marathon bombings. The Boston Marathon bombings were horribly wrong, but I think it is fair to say that the model for these bombings is the past and continuing conduct of the United States government. If "war zones" are anywhere, and anyone can be killed without warning, as the United States' drone program suggests must be true, then no one should be surprised if Boston, or New York, or Chicago, or San Francisco (or name your home town) might seem to be an appropriate target for those who believe that U.S. drone killings are just as offensive and horribly wrong as the Marathon bomb deaths. Isn't it true that we can say this about thousands of the victims of the U.S. drone war? : "She was not the enemy ... They didn't even know her." "U.S. drone killings are just as offensive and horribly wrong as the Marathon bomb deaths." The Marathon bomb killings were murder, a civil offense subject to United States law. U.S. drone killings are official United States government policy, subject to international law under the World Court. We can't do anything to murder, other than to bring the perpetrators to justice. We can stop the United States government, our government, from continuing to violate international law. It's false to claim only 2% of of the drone killings were "actually terrorist targets". The number 2% comes from a 2012 CNN report which referred to "high-level targets" killed in drone strikes. The very same report says "The civilian casualty rate has been dropping sharply since 2008. The number of civilians, plus "unknowns," those individuals whose precise status could not be determined from media reports, reported killed by drones in Pakistan during Obama's tenure in office were 11% of fatalities. So far in 2012 it is close to 2%. Under President Bush it was 33%." Using misleading statistics and misquotations to fit your narrative is lying and only acts to discredit that narrative.